Home / Longarm Machine Rental / Floral Quilts are Blooming! Flowers are blooming here at Quilted Joy. Floral motifs are so popular with fabric designers, so it is not uncommon for us to see many beautiful quilts sporting a floral design. They can be as unique and elegant as there are unique and elegant blossoms in the world. Here are a handful of some of the flora that have crossed our threshold in recent months. Marie found this top under the stairs at her family beach house. Without a note giving more details as to where the top came from, she is assuming it was made by either her grandmother or her great grandmother. This does bring to mind the importance of putting labels on all the quilts you create. Your children and subsequent generations to come will bless your name if you do. There is nothing more exciting than discovering a real family treasure in an attic or under the stairs, only to be disappointed when you know too little about it. She finished it with a free hand floral meander which looks great when you want the piecing and the fabric to do all the talking. Michelle took her certification class with this quilt top. Isn’t it adorable? It was a kit which added one little challenge. Quilting on your sit down machine or hand quilting doesn’t require quite as much fabric on the back as a stand up longarm requires. It was a challenge, but she did a great job of keeping that top right in the middle of the tight fit backing fabric that was provided with her kit. She quilted it with a popular paper pantograph called Periwinkle. It consists of fun five petaled blossoms with leaves. A great choice for a quilt top covered in sunflowers. I love the occasional larger block. What a great quilt design to showcase your favorite fabrics! 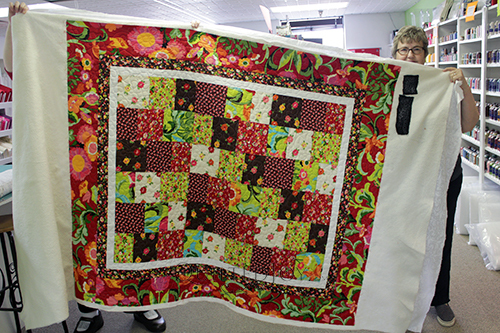 Nancy and Mary are sisters who work together to complete their quilts. They made this beautiful batik quilt with sunflowers. The quilts they bring in often have this super wide border. If you can imagine the beautifully pieced center fits right on top of her bed and these wide solid borders then drape down the sides towards the floor. Large amounts of solid are great places to show off your quilting skills, so don’t shy away from using them. They completed this quilt with a pantograph called Bell Blossom. It is a five petalled flower with pointed petals. It helps accentuate the flowers and echos the design into the solid space, a great choice. This is one of two quilts that Margie quilted with us that day. The design is so simple but the fabrics she chose are as vibrant and pretty as the story behind it. Margie made this quilt for a former kindergarten student she taught who was dealing with chemotherapy. Before she could finish it, her friend passed away. This friend’s mother was a teacher herself and a friend as well, so Margie was finishing it for her. Everything went beyond smoothly for this quilt. The flower and heart design board she chose fit perfectly from edge to edge with the hearts centered right in the borders. Every time her bobbin ran out it was while she was basting or she had just finished a pass. We wondered if the daughter was there to ensure perfection for this gift for her mother. This was Joanna’s certification class quilt. It is a one block wonder. The entire quilt, except the two inner borders, is made up of the same fabric and the same hexagonal block. By stacking layers and cutting them at once, she creates the kaleidoscope patterns you see with the print of the fabric itself. I love the broad variation and the fact you can’t easily see where one block ends and the next begins. It is so lovely. She quilted it with a meander design board which gives the function of the quilting without adding an additional design element. Very nicely done. Flowers are a beautiful part of our world today. There are so many colors and shapes to inspire the imagination. Whether with fabric, blocks, or quilting, flowers are a fun element to be incorporated into your next work of art.